The deities will stay at Gundicha temple for a week during the nine-day Ratha Yatra festival. Puri: Thousands of devotees today pulled the chariots of Lord Jagannath, Lord Balabhadra and Devi Subhadra till their destinations at Gundicha temple, about three kilometers from the main temple, despite downpour across the town. The pulling of the chariots to the Gundicha temple were halted midway yesterday due to sunset. Traditionally, chariots are not supposed to be pulled after dusk. The deities will stay at Gundicha temple for a week during the nine-day Ratha Yatra festival. The devotees can see the Lords atop the chariot till tomorrow before they are taken to the Gundicha temple in a procession. 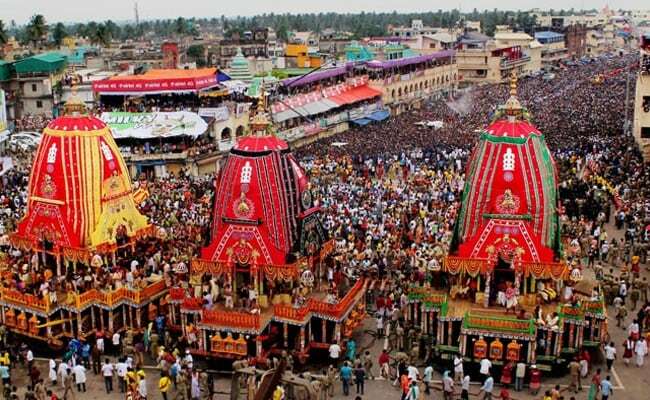 Meanwhile, the police have made elaborate security arrangement around the chariots and no devotee is allowed to climb them or touch the deities.